This house, initially excavated between 1903 and 1905, is thought to have once belonged to Gnaeus Poppaeus Habitus. Situated on the Via del Vesuvio, it is a refined dwelling, richly decorated throughout. It was named after the glass discs etched with cupids found in a cubiculum off the peristyle. The tablinum has a fine white mosaic floor with a narrow double border in black and a central decorative panel with a geometric design in black and white enhanced with coloured tesserae. Doorways on the south side of the tablinum open onto the north east corner of a large peristyle (g). 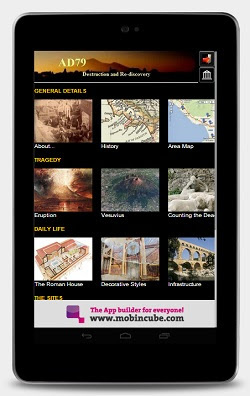 Like the tablinum, the exedra has a finely decorated floor of white mosaic. Here the floor is bounded by a single thin black border while in the centre of the floor is a decorative geometric pattern in black and white (pictured below). To the south of exedra (f) on the east side of the peristyle is a narrow passageway which leads to the adjoining fullonica (Reg.VI, Ins 16, 6). Immediately south of the passageway is a shallow recess used for storage. In the south east corner of the peristyle is a painted lararium (i). In the centre of the west side of the peristyle is a large triclinium (l). Unlike the rest of the house, there is a obvious lack of decoration, as the walls were simply dressed in coarse plaster. Much of the pavement in the central and eastern section of the room had also been removed, possibly by post eruption looting. Immediately to the north of the triclinium is a cubiculum (m) pictured opposite. The walls are decorated in the fourth style, with central panels on a yellow ground featuring Leda and the Swan, Aphrodite Fishing, and Artemis and Actaeon. In the side fields are small portrait medallions, one of which is shown here. In the north west corner of the peristyle a small vestibule opens onto the service area which included the kitchen (n) and latrines. Beyond the service area a short passageway leads to a posticum (o) which opens onto the Vico dei Vettii at No.38. The fauces opens off an unprepossessing facade on the west side of the Via del Vesuvio (pictured opposite). The third style decoration of the short fauces (a) is now badly faded except for the upper zone which is decorated with bird life including a rather splendid peacock. The fauces leads to a square atrium (b) with a central impluvium. The atrium (pictured left) is now in a poor condition, but, from what remains, the third style decoration originally appears to have consisted of red panels featuring figured landscapes separated by black bands. 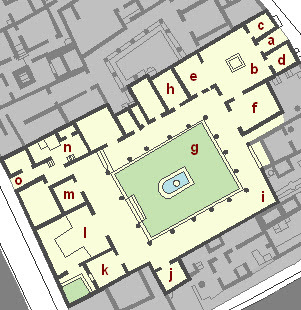 On either side of the entrance are cubicula (c and d). Both rooms are decorated in the same manner, with red and yellow panels separated by black bands above a lower black frieze. The panels are decorated with small floating figures. The red and yellow central zone in each room is topped with a denticulated stucco cornice. On the west side of the atrium is the tablinum (e) which is also decorated in the third style. The decoration (pictured opposite) consists of orange/yellow panels either side of large central panels featuring mythological scenes all above a lower black frieze. The one surviving panel (on the west wall) depicts Helen and Paris at Sparta, a detail from which is pictured below. On the south side of the atrium a doorway leads to an exedra (f) which also opens onto the east side of the peristyle. The exedra is decorated in the third style, with large figured central panels on a red ground above a lower decorative frieze (pictured left and below). In the south west corner of the atrium is a doorway which leads directly to the peristyle (pictured below). The peristyle is colonnaded on all four sides with elegant fluted columns composed of stuccoed brickwork. In the centre of the peristyle is a small garden with an ornamental pond and fountain. The walls of the peristyle (also pictured left and lower left) are decorated in the fourth style with ornamental bands and floating figures above a black lower frieze. Around the temple style lararium (pictured below) on the north side of the peristyle were found several bronze vessels and six statuettes. To the east of the lararium on the same side of the peristyle is a cubiculum (h) bearing the decorative features after which the house was named. The walls are decorated in the fourth style with a yellow and red wallpaper style pattern of hexagons, rhomboids, and squares topped with a stucco cornice (pictured left). The lower frieze is decorated in red and green rectangles. The walls bear witness to the four insets of gilded glass disks (long since removed) depicting the cupids after which the house was named. The decoration of the upper section consists of orange/yellow panels on a red ground containing images of Isis and other Egyptian deities (pictured left). On the lower part of the lararium are twin snakes on either side of a painted altar (pictured above). On the south side of the peristyle there is a solitary room (j), a cubiculum, decorated in the fourth style. The decoration (pictured left and below) consists of orange/yellow panels interrupted with broad, red decorative bands. The panels contain small portraits, mythical sea creatures and still lifes. Off the south west corner of the peristyle is a cubiculum (k) which is lit by a window on its west side. The fourth style decoration consists of white panels on a white ground framed by a painted pergola. Around the pergola is a variety of bird life while in the centre of the panels are a series of small floating figures. The vaulted ceiling retains some of its fresco detail (pictured opposite).